When we chose to relaunch our blind tastings with a look at hoppy reds and ambers a few months back, it was more a case of finding something we hadn't looked at in a while than thinking it was a particularly "on trend" slice of the multi-dimensional beer spectrum. Yet, while most talk around the craft beer water cooler is of IPAs, sour beer styles and barrels at the minute, it's fair to say this has been a winter well served with hoppy reds and ambers, India red ales and the like. 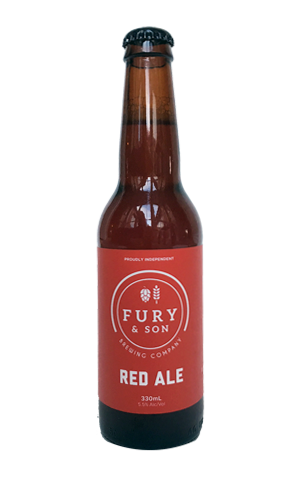 And, as the seasons change, Fury & Son has thrown one into the ring too. Loitering somewhere around blood orange/amber in colour, it's a beer in which the scales are tipped in favour of the hops, with what we presume is a combination of American varieties serving up orange marmalade and pine aromas and flavours plus a resinous, lingering bitterness. They're kept company by toasted caramel malts in a beer that delivers a punch not dissimilar to its bright red packaging.